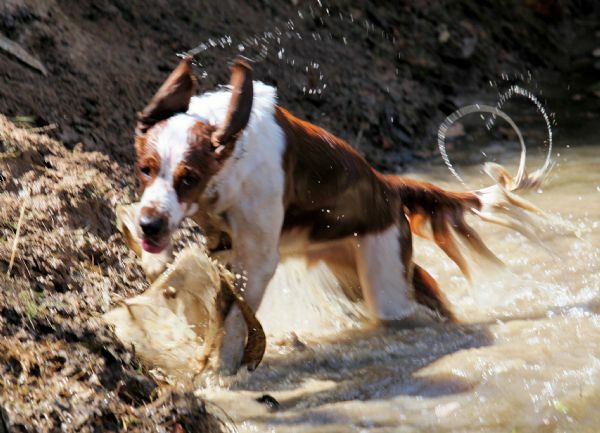 'Tally' coming out of the dam & having a good shake! 'Tally' (Supreme Champion Ricochez Auryn Talyessin CCD CD RN RA RE) & 'Meazle' (Supreme Champion Sunspur Zeuss CCD CD RN RA ET) in the dam. 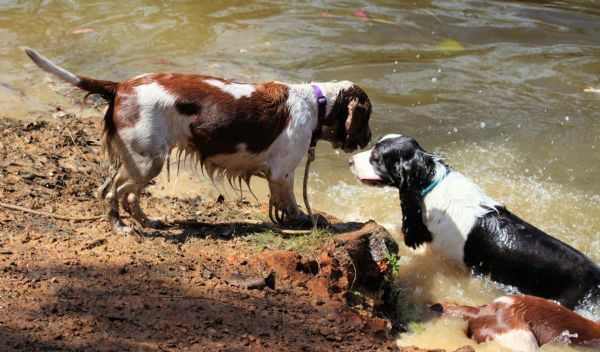 They just LOVE to swim & play in the water! See! 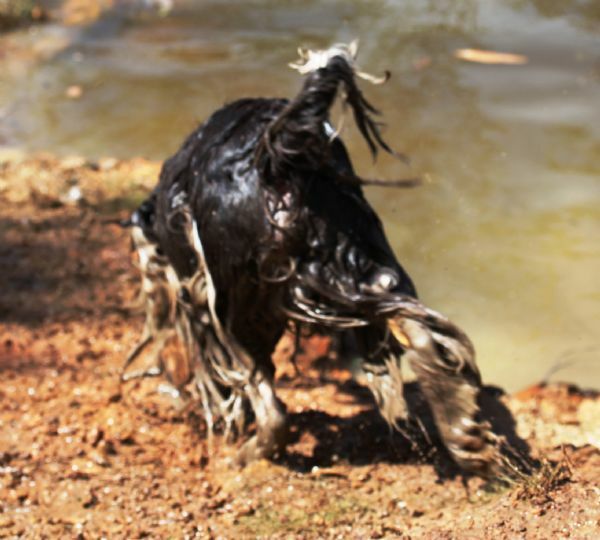 Show dogs DO get filthy! 'Meazle' as he prefers to be! Filthy & wet! 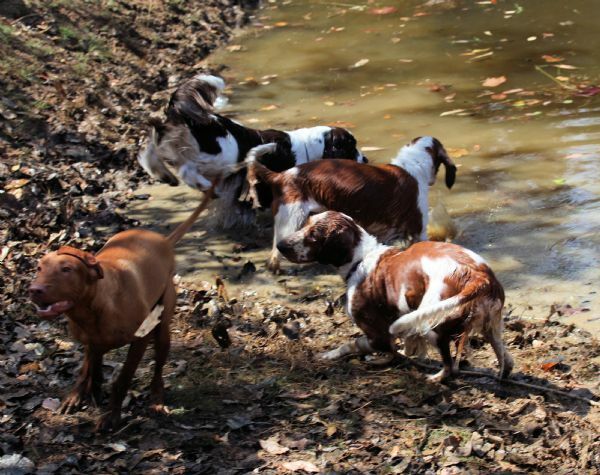 'Tally' (Welsh Springer)leading the way for 'Alf' ('Ch Aranybajnok Good One Alf' ~ Hungarian Vizsla) & 'Ruby' ('Ch Bethry Ruby Red Dress'~ Welsh Springer), all playing in the dam. 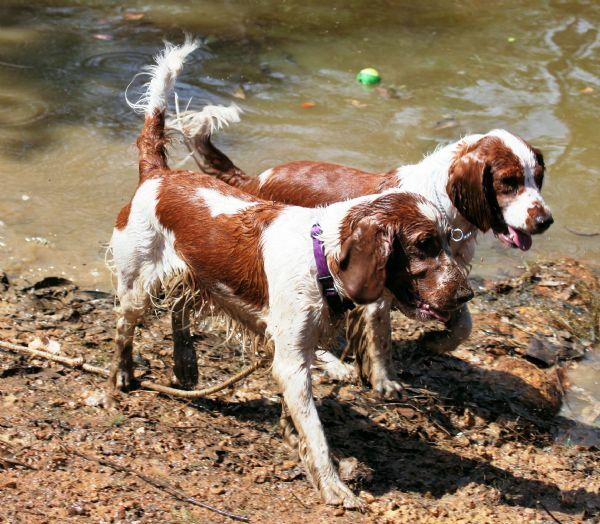 'Tally' & 'Ruby' ('Ch Bethry Ruby Red Dress'~ Welsh Springer Spaniel) proving that Welshie's LOVE nothing better than playing in the water & mud! Coming to get 'ya! 'Tally' dripping wet! 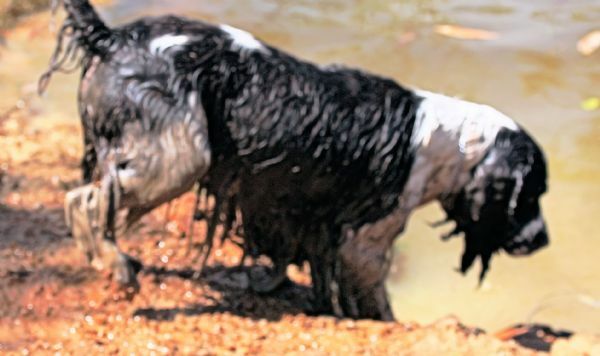 'Meazle' our Supreme Champion English Springer ~ showing his best 'bits' all filthy, muddy, wet & happy! 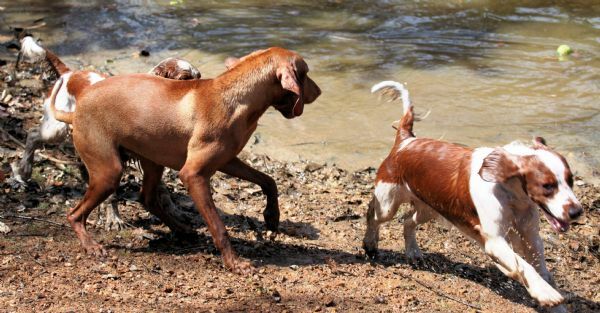 'Alf' ('Ch Aranybajnok Good One Alf' ~ Hungarian Vizsla), 'Meazle' (Eng Springer) & 'Ruby' ('Ch Bethry Ruby Red Dress'~ Welsh Springer) & 'Tally' just loving it! 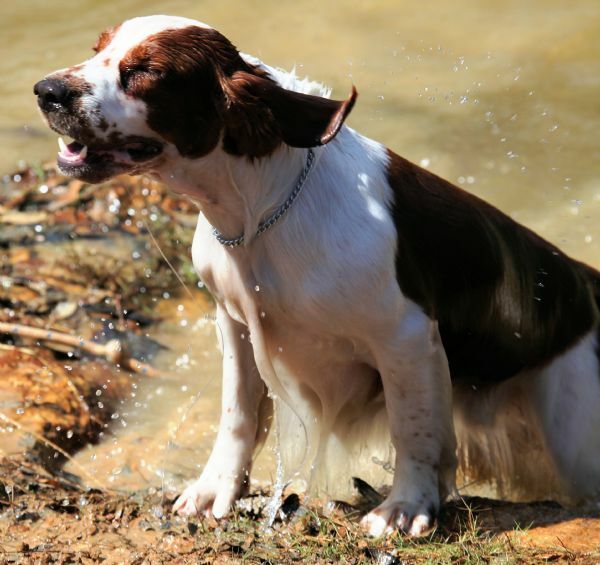 Even beautiful old 'Pongo' (Eng Springer) doesn't mind a dip in the water! "Come on! You can do it" says 'Ruby' ('Ch Bethry Ruby Red Dress') the Welshie! 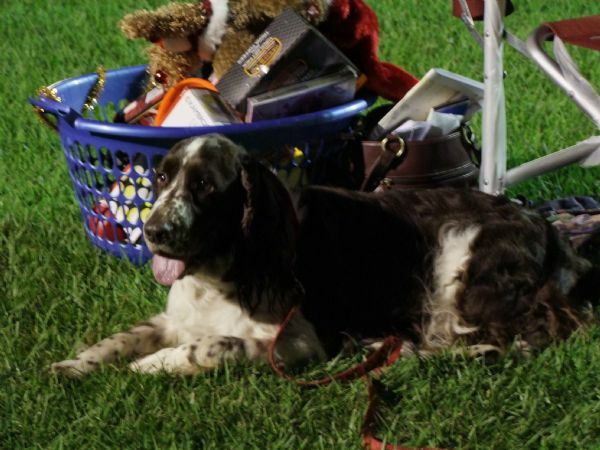 'Max' ('Neut Ch Tarnell Rider Oth Storm CCD ~ Eng Springer) guarding the food hamper at Christmas! 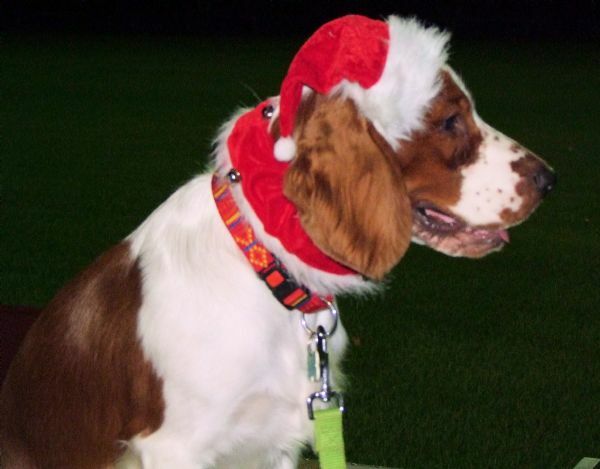 A young 'Meazle' ~ & he still loves his Christmas hat! 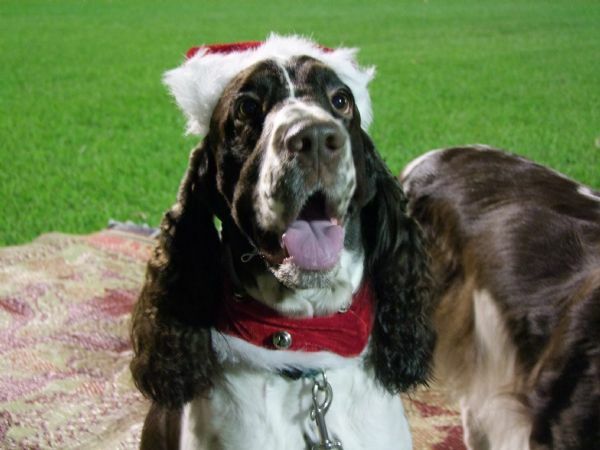 'Tally' the Welshie who is not as keen as 'Meazle' on this Christmas hat caper! 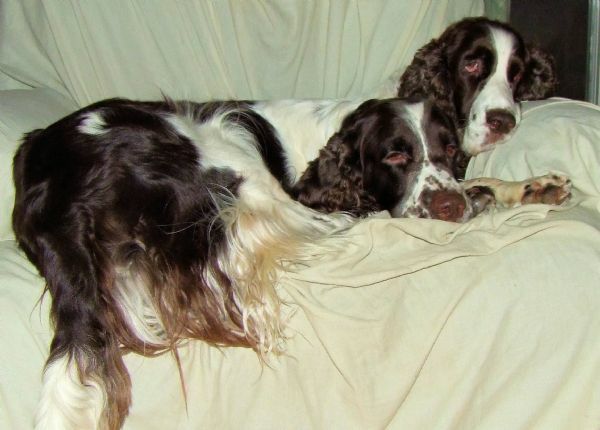 'Pongo' & 'Meazle' stressing out!